That’s wrong simply in the sense that 7.8% is still an elevated unemployment rate (suppose the rate were 15%–would you feel better if someone pointed out the 85% are still at work? 100%-unemp is just not an elucidating metric). But it’s more wrong in the sense that high unemployment has negative spillovers for most of those still at work. In a labor market like ours, with low unionization rates, bargaining clout for many in the workforce is very much a function of the unemployment rate. Excess labor supply over labor demand typically puts downward pressure on both nominal and real wages. The figure below plots real hourly wages for non-supervisory workers—blue collar workers in manufacturing and non-managers in services (about 80% of the workforce). 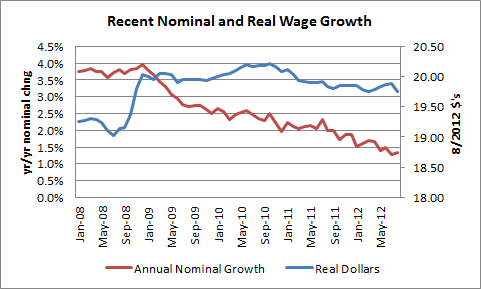 It also plots yearly nominal growth rates of that same hourly wage (before accounting for inflation). As you can see, the latter series just keeps trending down, and that’s what I mean by a weak labor market hurting workers and their paychecks. Factoring in inflation shows some interesting nuances—even as nominal wages were slowing back in late 2008, declining price levels boosted the buying power of the hourly wage. But more recently, the combination of price growth and high-unemployment-induced slower nominal wage growth is lowering hourly pay. Silly season caveat: I can easily see the RNC citing this trend of evidence of the President’s failure, yada-yada…but that’s malarkey, as the VP would put it. The American Jobs Act, proposed by the President in Sept 2011 and completely ignored by Congressional conservatives, would be chipping away at the high jobless rate as we speak. The Romney/Ryan rap on this makes no sense. Their side erects road blocks to prevent the fire trucks from getting to the fire and then complains about the heat. And before you want to get all “stimulus doesn’t work” on me, check out the excellent box 1.1 on page 41 from the IMF World Report. A bit wonky, but they’re basically finding that austerity isn’t just counterproductive re growth and jobs. It’s a lot more so than they thought. This is just a particularly lousy time to unlearn the fact that spraying water on burning buildings really does quell the flames.